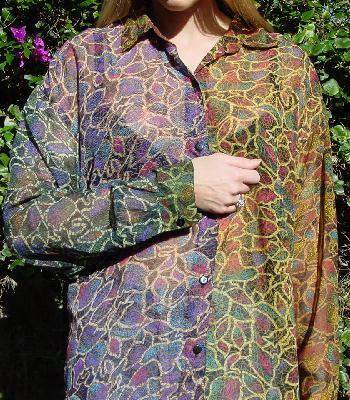 This sheer multicolored patterned blouse has sections (sleeves, front, and back) each with a different combination of black, brown, lavender, hot pink, magenta, turquoise, medium blue, mustard, maize, teal, olive green, orange, red, celery, grass green, tan, yellow, and beige. 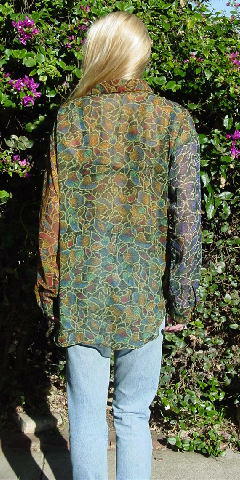 It's a very pretty blouse. A New York model wore it when she was pregnant. 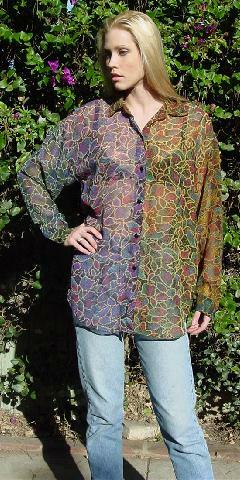 shoulder to wrist 22 1/2"
shoulder to front hem 30"
shoulder to side hem 26"